Yay! I just finished up my Zigzag Tote from the book Zakka Style by Rashida Coleman-Hale. As you can see when it came to picking colors, I strayed from the natural linen example in the book. Robert Kaufman’s Essex Linen comes in so many beautiful colors and these were calling to me. Loudly. I used medium aqua, carrot, hot pink, grey and sunshine. My bag making skills lie somewhere between novice and expert. Intermediate maybe? I’ve got to say, the zigzag tote was hard for me. For some reason, my patchwork piece came out bigger than it was supposed to and I ended up cutting off some of the triangles to make it fit. Sob! The lining was already cut, so I felt like I had to. Two sobs! Eyeballing the triangles to line up was hit or miss. Some rows turned out better than others. I wish I knew exactly where to measure and line them up properly. You can't tell from far away, but they are bothering me a teensy bit. After I finished sewing the last stitch, I realized I sewed the front on upside down. D’oh. Oh well, the people at the library will never know it was supposed to go the other way. Shhh. It will be our little secret. I was inspired by Terri’s version to add some hand stitching. I wish mine looked a little less “my kid made this” and a little more “ooooh, nice”. I used Cosmo floss in yellow, hot pink and orange to coordinate with the front. It pops nicely off the gray linen doesn’t it? My machine was not happy sewing through the bulk of the fusible fleece. The safety function on my sewing machine kept turning on when I was sewing down that last line of stitching along the top. I think it thought I was sewing through my finger or something. Eep! Phew. It was a process and now that it’s done I like it. A lot. The colors make me smile. The size is perfect for our trips to the library. 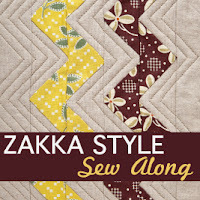 Check out all the awesome zakka style projects in the flickr group. Lots of great looking totes in there! Nice job. I love how it turned out. I think your hand stitching is great. We are always our own worst critics. In the bag I just made for my mom, I sewed the pocket down, only to realize that I didn't sew the lining to the pocket and had a rough edge on top, do'h. this bag is so great1!!! Cool, love the bright colours! My zig-zag pieces all turned out too long too, and having made 4 of them at once (yes I did consider calling the men in white coats a couple of times!) I can say I think it's the way the pattern's written! I love your tote SO much (it's even better in person)! I haven't started the tote yet because I too want to make it with colors. This is great inspiration for me! Great job! I'm really looking forward to your turn at the Zakka next week! That is adorable! I can't wait to see your itty magnets! Of course, to me it looks perfect! Very pretty colors and love that touch of hand stitching. You should be proud!! Love the colors and hand stitching! So pretty! I love the bright colors, and the hand stitching is a nice touch. I LOVE your "take" on this. Beautiful! Wow! A very happy bag! Glad your machine limped through that last seam and made it to the finish line. Gorgeous results! Okay, I was thinking of making this, but honestly reading your account brought back my nightmare that is called "The Amy Butler Weekender Bag." Still, I think your bag looks great! I think it's fabulous! The colours are great and your zigzags are MUCH straighter than mine were. The boxiness of the bag was a misprint in the book, several of us discovered it when we made the bag! I love your version! It's so pretty. I really want to make all the projects so far! But must finish my own first. Your bag is lovely and fun! I can't tell about the triangles being cut off, even in the closeup. I had to do it, too, and I appreciate your point of view...makes me feel like I'm not the only one who didn't know how to line up the triangles. But the results are really great!